The David Garrick papers at Hereford's Museum Resource & Learning Centre consist of over 200 items. Most of them are manuscripts, although there are some published works. The manuscripts range from single scraps of paper only a few centimetres wide, to documents containing many foolscap pages. Some of them are in David Garrick's own hand, other items belonged to him. Many of the documents relate to the settling of his estate after the death of his widow in 1822. One of the most important items for theatrical history is Garrick's working copy of George Villiers' The Rehearsal, in which the part played by Garrick is underlined and in some places he has added new lines for himself. Other theatrical items include Garrick's scurrilous sketch 'Ragandjaw' and his script for the stage presentation recalling the Shakespeare 'Jubilee' he had mounted at Stratford in 1769. There are receipts for making and painting stage sets. More personal items include unused bookplates from his extensive library and the printed invitation to his funeral at Westminster Abbey on 1 February 1779. Other papers relate to the home-life of David Garrick and his wife Eva Maria Veigel. There are receipts for Wedgwood cups and saucers, garden furniture. 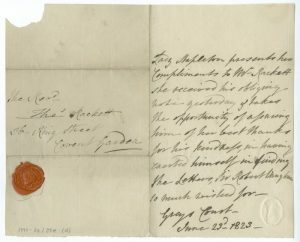 Garrick's taste as a collector of books, paintings and engravings is reflected in the receipts, as is his enjoyment of recreations such as fishing and playing bowls. There are many inventories of the contents of the Garricks' house at Adelphi Terrace, London, and their villa at Hampton, which list paintings, books, furnishings, glass and silverware. The printed sale catalogue of Mrs Garrick's effects in 1823 runs to eight pages. The papers were purchased at auction in 1992, when a number of items were put on sale by the descendants of the Rev. Thomas Rackett, the executor of Mrs Garrick's will.